Mensusa https://www.mensusa.com/articles/gold-men-blazer-show-up-in-style.html Gold Men Blazer- Show Up In Style Pair a gold men's blazer with a black bow tie and a crocodile belt to look the brightest and best in the room. How many chances is a man going to get in a lifetime to wear a gold blazer? Probably not very many. So if you have the opportunity to wear a gold mens blazer as part of your formal wear, you should probably take it seriously. When choosing a blazer, pick a style, length and gold hue that you like. Some darker versions will not stick out as much, and some lighter ones might. Overall, decide what kind of look you are going for and begin with the blazer. You can build the rest of your outfit thereafter. It isn't the gold men's blazer alone that is going to make or break the outfit you are planning on wearing to your next event. It is the combination of gold blazer, other pieces of the suit and accessories that will make your outfit absolutely shine and make you truly stand out in a room. A gold blazer will go best with dark, usually black, pants. This will also match your darker crocodile shoes and your matching belt. You can also match all this with a matching crocodile watch band as well, to balance out the gold blazer with darker colors. A little contrast is never a bad idea when you are choosing colors for a formal outfit. Pretty much if you are making gold your accent color in your outfit, otherwise known as the main color of what you are wearing, you are making a commitment to a bold and unique style. This is a great move, especially if you do not want to be dressed the same or similar to any other guys around. 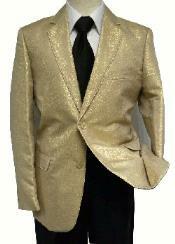 Wearing a gold blazer very well may be a once in a lifetime opportunity, so if you are going to do it, do it right. Pair your gold blazer with a solid color dress shirt and matching gold vest, then go out on an even more unique limb and add a black velvet bow tie, too. If you are going for the gold men's blazer, here are the steps to building the perfect combination to an even more perfect and classy ensemble. Once you have the gold blazer, you're going to want to have something to go under it. Your best bet is probably a white shirt with a thin collar. Banded collar shirts are the perfect option in this case because you do want to stand out, but not too much, and having too much of a collar while wearing a gold blazer might not be the best idea. You don't want to go too crazy with colors, patterns or collar styles here, because wearing a gold blazer is already a pretty bold (but worthwhile) move. Black will also work, but be mindful of your tie. What is classier than just any old black tie? A black bow tie. And what is even classier than a black bow tie? A black velvet bow tie. This is exactly the kind of style move you will want to make if you are looking to make a statement. You most likely will not find anyone else in the room wearing a black velvet bow tie, and you are already wearing a gold blazer with a gold vest. So your chances of having the most unique style in the room are fairly high. If you're going for unique and high end, which, guessing by the pieces we have added to our gold blazer combination so far, you are, you will want to go with great quality shoes to match the rest of your outfit. Belvedere mens shoes give you the style you are looking for in the texture you want. Go all in: remember, this is your chance to shine. And finally, with your Belvedere crocodile shoes you can do what you should always do with crocodile shoes: pair them with a crocodile belt, of course. Remember to always match your shoes and belt don't try to mix and match styles and colors. Keep it uniform. The reason you will want to choose a crocodile belt to go along with your gold blazer is that you want to both stand out in the crowd and look good doing it, so choosing this option will mean you can look your best and look the best out of everyone around you. Your shoes, belt and accessories can act as enhancements to your already outstanding outfit, but they are of course optional and you can also mix and match with accessories you already have instead of buying new ones.